One of the ways in which I try to keep an active writing life is by meeting with other writers in the real world. We don’t spend much time writing when we meet, but it’s a nice way to remember that there are people behind those mysterious blog posts, short stories, poems and discussions that I get embroiled in online. One of my friends is a guy who’s been working on fantasy stories. He’s very passionate about writing, and very dedicated to fantasy. But he despairs at his chance of publishing traditionally, because he perceives that he writes fantasy that’s too untraditional for the publishing world. This statement intrigued me for a couple of reasons. First, this guy writes in a fantasy, otherworldly setting. So if his world is poorly constructed, it’s gonna show. Doesn’t he want his work to be the best it can? Secondly, revealing the world is kind of like revealing exposition. It should be done a little at a time, at points of relevance, so that by the end of the story we have a complete picture without any boring word dumps. Does he think that the people in his story have to bum around with someone like Tom Bombadil for fifty pages or so in order for a publisher to give him the green light? 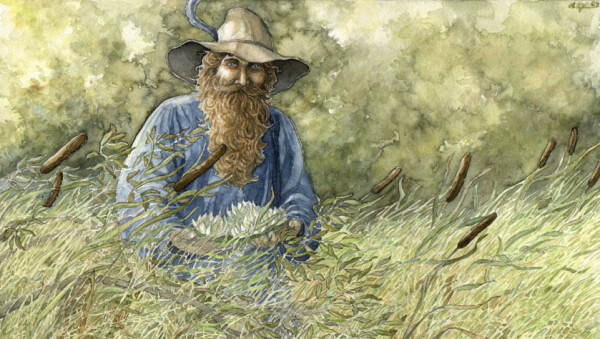 Ah, Tom Bombadil. People either love you for the world you reveal, or hate you for impeding the story. Of course, Tolkien is the Grand Maestro of worldbuilding. But we don’t have to be like him. We don’t have to invent loads of different languages, stories, races and religions that never show up in the completed work. Even George R.R. Martin didn’t do more than write key phrases of his languages. HBO hired a linguist to work the rest of them out. In October 2012 I wrote another post on worldbuilding, detailing the sorts of things that we often forget but which make the world we write in so much richer. My friend is clearly of the opinion that the world doesn’t matter. How true is that? If you’re a fantasy author who writes about people in a world different to our own, then you’ve already started to build a world. The magical rules they follow imply a different kind of physics. The social rules they follow imply their traditions, their politics, and to some extent their history. Even using vague monetary denominations such as copper, silver and gold pieces implies mining practices and the social value of these metals. As fantasy authors we ask readers to accept our new world rules. So we’d better know what they are ourselves. If it helps, we can think of our world as yet another character that needs development. Whenever I come to an understanding of how something works in my world, I write it down. Let’s take the money example. Is it metal money? How do they get it? Do they make coins from it, or do they use pieces by weight (such as the anglo method of clipping pieces off an armband)? If people use paper or other kinds of money, how is it printed/made? How can they ensure that no one will counterfeit it? How much of that information gets used in a piece? Almost none. But if you mention the mines down south, or the Grand Treasury, that’s all you need to hint that those procedures are in place and that you’ve thought about them. It enriches the world without shoving the worldbuilding aspect under a reader’s nose. All authors look upon certain writing chores as unfavorable. Sometimes you just have to buck up and do it. Worldbuilding is one of those times. Otherwise, urban fantasy could use a refit from all those sparkly vampires. This entry was posted in Uncategorized and tagged doing it right, fantasy, novels, publishing, traditions, world building, writing about writing. This is a great post, and I really enjoyed reading it. Like you say, how can you have a fantasy novel without world-building? As soon as you put people in a scene, dress them in an outfit, give them a name, make them head in a direction, you are already world building. Perhaps your friend has a skewed view of what world building really means? I know lots of writers sit and draw maps, and flesh out countries and borders before they ever start writing, but l prefer a more organic approach. I always write with a notepad, sketching things as I go, whether it be people, or buildings, or countries or locations. Like you say though, you often have to pull up and think things through for how things will work, even if it only ends up being a sentence worth of the novel (esp. things like magic, social systems etc). Its those little details that make fantasy feel “real”. Thank you for your comment. You’re right, he probably thinks of world building as spending long hours drafting histories, maps, and other material that never sees the light of day unless you’re Terry Pratchett or Tolkien (or similarly big). I used to spend hours and hours drawing maps of my worlds. Nowadays I am usually a bit more organic, like you. My drawing is terrible, though, so I don’t do a lot of sketching. *laughs* my drawing is awful too! Definitely won’t be illustrating my own novels anytime soon! Worldbuilding is incredibly important in fantasy – here’s a fabulous article about why. Thanks for the reblog! I’ve been enjoying going through your work as well!